The Taoiseach knew about the issue on Sunday, but didn’t inform the Justice Minister until Monday. Now the opposition would like to know why. THE OPPOSITION HAS called on the Taoiseach to clarify why he did not tell the Justice Minister about taping of Garda phone calls for over 24 hours. Enda Kenny was made aware of the system, which has led to the establishment of a commission of investigation, on Sunday but did not inform the Justice Minister until a meeting with him the following evening. The Government Press Office has not responded to a number of requests for comment on why Kenny delayed informing Shatter, but the justice spokespeople for both Sinn Féin and Fianna Fáil say that Kenny should explain the delay. “I think that’s something the Taoiseach should explain and I’d be calling on him to give an explanation,” said Fianna Fáil’s Niall Collins. He added that it needed to be explained why Shatter wasn’t involved from the get-go. Sinn Féin’s Padraig MacLochlainn said that questions had to be raised by why the Attorney General Máire Whelan, who had been alerted to the issue in November, didn’t tell Shatter. He added that he felt there was “some lack of confidence” in the Justice Minister. MacLochlainn said that if reports that former Garda Commissioner Martin Callinan had been advised by a Department of Justice official not to withdraw his remarks about garda whistleblowers were true, it would be “shocking”. “It would be helpful if the Attorney General took us through the entire narrative. “The Taoiseach should answer those questions. It appears he made a decision about a commission of investigation pretty pronto on receiving the briefing. 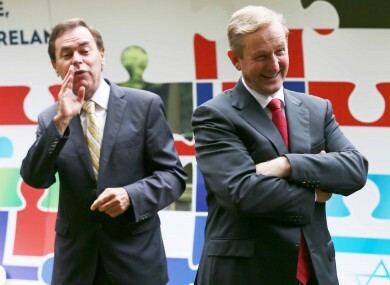 Email “"The Taoiseach should explain" - opposition want answers on Kenny delay in telling Shatter about taping”. Feedback on “"The Taoiseach should explain" - opposition want answers on Kenny delay in telling Shatter about taping”.